There's always a good deal at the Bazaar! Well, maybe not always, but that's what they'll tell you, anyway. Mercenaries aren't the only thing available here anymore. You'll be able to purchase (and sell!) additional resources now - but, how steep the price gets depends entirely on how much is (or isn't) available. There's always a good deal at the market! Well, maybe not always, but that's what they'll tell you, anyway. Sell Durantium before extensive mining drives down the price, or pay a premium to get some Elerium to construct that new prototype flagship you've been wanting. How steep the price gets depends entirely on how much is (or isn't) available, so buy and sell with care! In space, there is no biased reporting - that's because we've hired a robot to handle it! Check the news to monitor who's allying with who, who's declared war on each other, and many other activities that are going on across the galaxy. Keeping up with current events and galactic happenings is the best way to stay one step ahead of your opponents. Be prepared for anything! From famine to protests, you'll face new events that challenge your leadership and test your people. Certain governments and crises will award you with brand new ships that can't be obtained through any other means. Your choices determine your path and what rewards and penalties you'll have to deal with, so choose wisely. 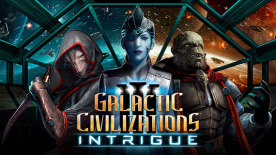 Please note: Requires Galactic Civilizations III (base game) to use this DLC.